20121016 - Up in the am to watch G open his presents before heading to school. Off to work and got a bunch done. I left in time so I would be home when G got there. 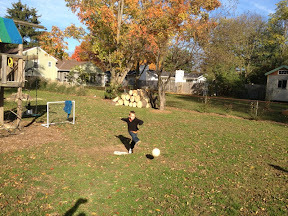 We then headed out back for a game of kickball at G's request. G&I beat the pants off L&J. Then on to Arby's for dinner as G selected, I think for the curly fries. Next to J's football practice and then home to watch his new movie 'The Avengers'. All boys to bed. They sure grow fast. Happy Bday my little G.